Introducing the Integrity, a 141 ft. luxury yacht customized to carry 16 adventurers in comfort, safety and style. 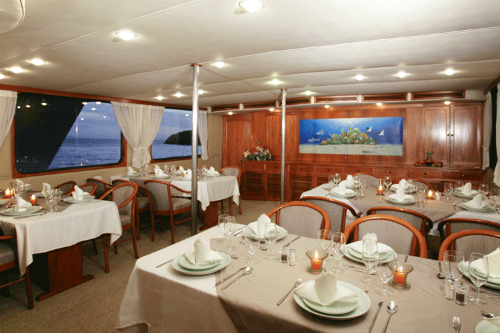 Integrity has been cruising in the Galápagos waters since April, 2005. The views through the picture windows in the salon and from the privacy of your stateroom are unobstructed and ever-changing as Integrity is quietly at anchor or cruises along. Rare, a place like no other on this planet, a visit you've likely dreamed about since you were a youngster. Islands where the birds and animals are unusual and have no fear of you.